And spend it at someone else’s house! IRELAND’S leading ferry company, Stena Line is asking everyone to forget about the cooking, the table settings and the unexpected visitors this Christmas and instead spend it at someone else’s house. 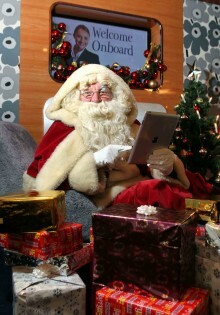 SANTA Claus will be swapping his reindeer for the Superfast ships on the Irish Sea this festive season as leading ferry company Stena Line is hosting Santa at Sea weekend cruises. Stena Line sees bookings rise as Christmas rush kicks in LEADING ferry company Stena Line is experiencing a ferry busy Christmas period as people make last minute bookings to travel home to Northern Ireland for the festive season. Stena Line almost £300*cheaper than airlines this Christmas CHRISTMAS never does come cheap, but leading ferry company Stena Line has a money saving travel tip for those making the journey home to Ireland for Christmas – and it’s a ‘ferry’ good deal with savings up to £300* when compared to flight prices. Stena Line up to £1000*cheaper than airlines this Christmas CHRISTMAS never does come cheap, but leading ferry company Stena Line has a money saving travel tip for those making the journey home to Ireland for Christmas – and it’s a ‘ferry’ good deal with savings up to £1000* when compared to flight prices. 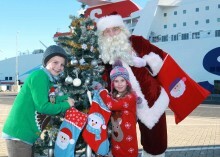 Book early to visit family and friends with Stena Line LEADING ferry company Stena Line is spreading some early Christmas cheer by offering fantastic low deals for customers who book early to visit friends and family this festive season.